In his signature candid manner, Premier Wen Jiabao addressed some of the toughest questions facing the country at the press conference that capped the annual session of the National People's Congress (NPC), the national legislature. As a close neighbor, separated only by a strip of water, China has been deeply concerned by the loss of life and devastation caused by earthquake that hit Japan on March 11. On Monday, Premier Wen Jiabao again offered his deep condolences to the Japanese people and more help if needed. CPPCC members must develop a strong sense of mission, so as to have enough courage to defy all the hardships they will encounter - including bureaucracy or unhealthy tendencies or even abuse of power by government officials - that might prevent them from finding the truth in their investigations. Our trouble is not that the wealthy are too wealthy, but that the poor are too poor. Every March, deputies to the National People's Congress (NPC) and members of the Chinese People's Political Consultative Conference (CPPCC) submit suggestions on behalf of the people. And almost every year, some of them become red-hot Internet celebrities after their controversial suggestions ignite fiery debates. People's livelihood is the focus of the annual sessions of the National People's Congress (NPC) and the Chinese People's Political Consultative Conference (CPPCC) National Committee. It is important not only economically and socially, but also politically, says an article in People's Daily. Chinese officials warn that their economy is poised to slow. 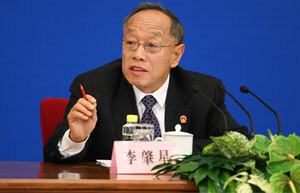 In late February, Premier Wen Jiabao announced that the target for annual GDP growth over the next five years is 7%. Readers' Comments: What about inflation? Liu Binjie, head of the General Administration of Press and Publication, said he is confident the country will strike a balance between imports and exports of books and publications during the 12th Five-Year Plan (2011-2015) period. Regional governments are pushing central authorities to approve more land for construction to accelerate economic development - a theme encapsulated in the recent proposal by a NPC deputy from Shaanxi province.